So….I am exhausted and I can’t even imagine how our instructor feels. And she is still on the flight home. It was Sara Lamb. I met Sara a few years ago at SOAR and then 2 years ago I took her Knotted Pile intensive 3 day workshop. It was fun and somewhat easy to learn. The results are also spectacular. So I invited Sara to come and teach the technique at my shop. When I asked her I wasn’t even aware that her book would be out by the time she would be teaching. I just invited her because my SOAR project wasn’t finished and I lost my instructions and needed a refresher. So her book came out and it has all of the information I needed! This is a book for everybody. 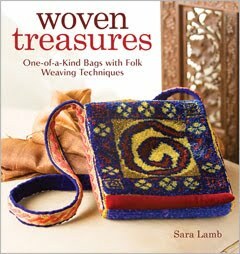 I think that some people may discount it as “just” a weaving book. It is not. It also is not just knotted pile. All fiber people would be interested in these techniques. The loom used is a rigid heddle as a frame. It is easy to warp and easy to do. Really, get the book and then try it. Sara got in late on Thursday night and then we had all day Friday to get ready for the class which started at 6PM on Friday. To fill time Sara taught me some wire wrapping techniques. So I made this lovely Tiara. I think I need to add something in the center and I still have some beads and wire left so I can. We went to dinner and came back and got to work warping. Saturday morning the warping was done and we got down to business. See how intent they all are? Let’s go around the room and see who was lucky enough to be there! Pat and Carol worked hard and were delightful. They were two local girls. Mary Lee came from Ohio. She is a weaver and has taken lots of weaving workshops. Also she’s very cute and said I am feminine. I like that. Abby and Denny did nothing but argue the whole time. I wanted to split them up. Abby made good progress despite the frequent breaks and periodic icing of her aching hand. Sandi Wiseheart came from Ontario, Canada in her green Volkswagen Bug and made great progress. And Rachel and Stephanie chauffered Denny from Toronto but for some reason spent the whole class in the naughty room. Sara is a fun teacher with lots of knowledge and she would like you to buy her book. Isn’t she cute? I finished my project and we began warping my loom again for the next project. Most of the students in the class were using Schacht Cricket looms. I was using a copper pipe loom. It’s more complicated to warp and you have to make string heddles. On Sunday Sara also showed us how to make the handle for a bag using card weaving which was so much easier than we all imagined! I didn’t manage to get photos of everyone’s projects but here are a few. First they did a sample to figure out how many treads they wanted to hold together for each knot and see what would happen, then they began their projects and most were making bags. I didn’t even take a picture of my own project! I don’t know how to run the shop anymore without Chelsea. And to her right, Sandi is trying out her new Matchless. There was spindle shopping by many. And I happened to have a bag of silk that matched Stephanie’s outfit perfectly. I got it at SOAR in the silent auction and it was dyed by Sara Lamb herself. I hope she will spin it and use it in her next pile project. Sunday night many of us went to dinner at the Blue Fin which is a Hibachi restaurant. We talked a lot and I ate too much. And little Maggie was so happy to have some one on one time with her favorite person. This class was delightful and fun and I will have the lovely Sara Lamb back in a moment. If you have a chance, take her class. Wow. Whatta crew. Sara must have had her hands full keeping you all in line. *sigh* One of these days, I'll get to come spend time in the naughty room. And here's the other LynnH hanging her head low…. It looks like everyone had so much fun! I wish I could have been there!!!! !